Tennis elbow or lateral epicondylitis, is a painful condition involving the tendons that attach to the bone on the outside (lateral) part of the elbow. Tendons anchor the muscle to bone. 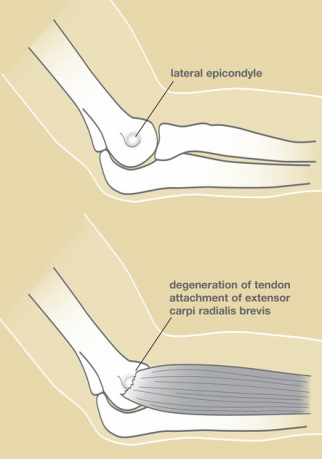 The muscle involved in this condition, the extensor carpi radialis brevis, helps to extend and stabilize the wrist (see Figure 1). With tennis elbow, there is degeneration of the tendon’s attachment, weakening the anchor site and placing greater stress on the area. This can then lead to pain associated with activities in which this muscle is active, such as lifting, gripping, and/or grasping. Sports such as tennis are commonly associated with this, but the problem can occur with many different types of activities, athletic and otherwise. Elbow Overuse: The cause can be both non-work and work related. An activity that places stress on the tendon attachments, through stress on the extensor muscle-tendon unit, increases the strain on the tendon. These stresses can be from holding too large a racquet grip or from “repetitive” gripping and grasping activities, i.e. meat-cutting, plumbing, painting, weaving, etc. Elbow Trauma: A direct blow to the elbow may result in swelling of the tendon that can lead to degeneration. A sudden extreme action, force, or activity could also injure the tendon. The most common age group with tennis elbow is between 30 to 50 years old, but it may occur in younger and older age groups, and in both men and women. Pain is the primary reason for patients to seek medical evaluation. The pain is located over the outside aspect of the elbow, over the bone region known as the lateral epicondyle. This area becomes tender to touch. Pain is also produced by any activity which places stress on the tendon, such as gripping or lifting. With activity, the pain usually starts at the elbow and may travel down the forearm to the hand. Occasionally, any motion of the elbow can be painful. Figure 1. The muscle involved in this condition, the extensor carpi radialis brevis, helps to extend and stabilize the wrist. Activity Modifications: Initially, the activity causing the condition should be limited. Limiting the aggravating activity, not total rest, is recommended. Modifying grips or techniques, such as use of a different size racket and/or use of 2-handed backhands in tennis, may relieve the problem. Medications: Anti-inflammatory medications may help alleviate the pain. Elbow Brace: A tennis elbow brace, a band worn over the muscle of the forearm, just below the elbow, can reduce the tension on the tendon and allow it to heal. Physical Therapy may be helpful, providing stretching and/or strengthening exercises. Modalities such as ultrasound or heat treatments may be helpful. Steroid Injections: A steroid is a strong anti-inflammatory medication that can be injected into the area. No more than (3) injections should be given. Shockwave Treatment: A new type of treatment, available in the office setting, has shown some success in 50–60% of patients. This is a shockwave delivered to the affected area around the elbow, which can be used as a last resort prior to the consideration of surgery.